for a secular state and against the military leadership. While outside commentators have repeatedly suggested that Egypt's revolution has stalled or gone backwards, it seems more accurate to suggest that the revolution is maturing as it continues to develop. Revolutions are periods in which politics speeds up and processes that previously took decades - in terms of changes in consciousness, institutions and social conditions - now happen over night. There is an inevitable back and forth as new forces surge forward, while older established institutions may push back or, for a time, drive the revolutionary wave in order to better control it. A prime example of this was the support by the Supreme Council of the Armed Forces (SCAF) during the phase of the revolution leading up to the overthrow of Mubarak. With the explosion of protests and strikes sweeping Egypt, the generals - all of them Mubarak appointees, some of them lifelong friends - recognized that the only way to control the revolution was to force the resignation of Mubarak, declare their support for the revolution and use their prestige to try to undermine any further developments. Since that time they have combined verbal support for the revolution, along with limited concessions, with continued repression of activists, the outlawing of strikes and support for counter-revolutionary forces. Nonetheless, the revolution has continued to advance, though it faces new challenges and serious dangers at each new phase in the struggle. 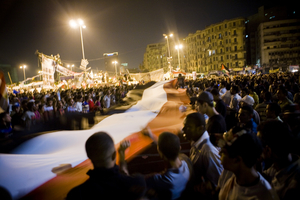 Friday's Islamist dominated protest in Tahrir Square, including the forcible exclusion of secular parties, even though an agreement had been struck prior to the protest declaring it a "Friday of Unity & the People's Will", was a clear demonstration that the revolution has entered what might be considered its third phase. In the first phase of the revolution, there was a spontaneous outburst of popular anger against Mubarak. All classes and ideologies came together with one clear purpose: to overthrow Mubarak. Under the general slogans of democracy and an end to the dictatorship very disparate groups could work together. In the case of the Muslim Brotherhood's leadership, it was very much against their instincts and often kicking and screaming that they were dragged into the revolutionary wave. This was an intense but relatively short phase that ended with the overthrow of Mubarak and a period of euphoria and support for the military, most clear exemplified by the slogan "the people and the army are one hand." The truth was that the army was itself not "one hand" but was divided between the lower ranks and the upper, with the danger that the conscript army might split or go over to the revolution wholesale, leading to its collapse. But because the SCAF came out quickly in favour of the revolution, they maintained and built their prestige amongst the population. A new development is the establishment of independent peasant unions which support collective action including retrieval of land. In May a conference held in the village of Kamshish, a historic centre of peasant struggles, founded a new Union of Egyptian Farmers. Among its aims is the building of a national co-operative movement run by farmers at grassroots level. In cities and villages across the country neighbourhood action groups have proliferated. As Popular Committees to Defend the Revolution they were formed initially to protect local communities from gangs of plainclothes police like those which battled activists in Tahrir Square in February. The committees have since led campaigns to purge corrupt officials, to reform public services including education, health, water supply and sewerage, and to tackle local issues such as control of traffic. Their national coordinating body met for the first time in Tahrir Square in April. But while struggle was rising based upon "local" issues, the military rulers were applying growing pressure on the movements through the arrests of activists who were then sent to military tribunals. They increased their propaganda, accusing worker activists of acting against the interests of the revolution. Meanwhile police and former regime figures who were charged with murdering activists during the revolution or engaging in corrupt practices to enrich themselves, were set to be tried by civilian courts. Except that those trials rarely happened and the accused were given lax bail terms. By the time there was a renewed explosion of protest in Tahrir in June and July, only one former regime figure had been found guilty - and he was out of the country. It made it inevitable that the local and economic issues would begin to re-converge around questions of the direction of the revolution. These battles also put pressure on the Muslim Brotherhood - the largest opposition force in the country. Composed of disparate social forces from big bourgeois to students and independent businessmen as well as the urban poor, the Brotherhood has a history of fracturing at key historical moments. Inevitably the different social forces are pulled in different directions under the pressure of polarizing events. In this case, the youth wing were drawn strongly to the revolution and worked side by side with secular and leftist activists. By June the Brotherhood leadership expelled some leading youth activists who were involved with the revolution's youth committee, which had been central to the early mobilizations that brought down Mubarak. There were also splits, including by some leading members who disagreed with the Brotherhood's strategies on the revolution, on the nature of their planned participation in the electoral process, on how radically to challenge SCAF, etc. Faced with this pressure the Brotherhood's leadership seems to have responded in a couple of ways. Firstly, it now uses the rhetoric of the revolution, which is necessary to have any credibility in post-Mubarak Egypt. At the same time it has worked with the SCAF to try and corral the revolutionary movement into the least profound forms of democratic change. It has opposed attacks on SCAF and has backed SCAF's opposition to strikes and demonstrations, as discussed on this article. In relation to the social deepening of the revolution with the great wave of strikes which were triggered by the uprising, the Brotherhood took the same position as the government and the Military Council, demanding "a return to work to save the Egyptian economy. The Muslim Brotherhood calls on all sections of the Egyptian people to keep the wheels of production and development turning. Demonstrations for sectional demands, albeit a fundamental right, are detrimental to production and damage the economy, particularly as the revolution is linked to keeping the motor of the economy turning. Citizens must feel that their sacrifices in the search for a dignified life were not just empty talk, so that the Egyptian people can prove that they are capable of a further achievement beyond the revolution, in other words, to lift Egypt out of its economic crisis." It seems clear that these attempts to play the same game as the military in supporting the revolution all the better to strangle it, the Brotherhood has had as little success as the military. While strikes declined in March after the great explosion in February, they rose again in April and there continue to be more independent unions established every week. And, of course, the movement once again took up the demands of the overall revolution - for the resignation and prosecution of regime figures, especially Mubarak; for an end to military trials of civilians; for a raising of the minimum wage, etc. This reinvigoration came from the fact that the movement had built in strength and depth through its success in the local arena and because the military resisted implementing the demands of the revolution so completely that their betrayal was now apparent. The Brotherhood responded by backing some of the demands - though insisting that calls for the overthrow of the SCAF were removed from any protest in which it took part. But with Friday's Islamist hijacked protest, it seems clear that the Brotherhood has decided that a more forceful hand is needed to put a lid on the further deepening of the revolution. Salafists are currently the Islamic wing of the "baltagiyya"(the counter-revolutionary thugs who attacked protesters in Tahrir Square) and their relationship to the security apparatus of the former regime is much more important than their relations with the Muslim Brotherhood. Since 2006 the Mubarak regime allowed the creation of Salafist satellite channels, which have been airing their poisonous views since that time, broadcasting a permanent stream of reactionary anti-Christian, anti-woman propaganda, as well as agitating against Muslims who do not share their views, in an attempt to drag the masses back to the Middle Ages. While leaders of the Islamist forces are knee-deep in their opportunism and clientalism to SCAF, I continue to be hopeful that the Islamist youth, those who defied their leaders and took part in the uprising shoulder to shoulder with their leftist and liberal brothers and sisters, would break the ranks and join us. This fragmenting of the base of the Muslim Brotherhood as a result of the radicalization and broadening of the base of the revolution will be a key dynamic in this next phase of the revolution. So too, it now seems clear, will be their increasingly open and bellicose relationship with the counter-revolution - both in their support of the SCAF but also in supporting the reactionary foot soldiers of the Salafis. So, it's inspiring and important to note that immediately after the departure of the Salafis and conservative Islamists on Friday, the Square filled with protesters demanding a civil and secular state. They also raised slogans against the SCAF - in contrast to the Salafis who chanted in support of the SCAF - ironic given that the army was used to crush the Islamists in the 80s and 90s. This reconquest of the Square was absent in western news coverage, which was filled with the Iran bogeyman - the threat that Egypt could go the way of Iran in the 1970s. However, there is no Ayatollah Khomeini in Egypt and political developments are nowhere near similar to Iran at the point where the Islamists had gained the upper hand. It seems - at this point - unlikely that the Islamists can replicate the local struggles that are actually winning material gains for the Egyptian people and so while some big central demonstrations, as happened Friday, can be intimidating, it is rather more ephemeral than the explosion of workers' unions, peasant unions, and neighbourhood committees to defend and deepen the revolution. This is a revolution that has nowhere near run its course. I totally agree. Thanks for the links!